This model describes the path that most teams take from forming, to storming, to norming, and then performing. When companies strive to achieve high-performing teams, they often fail to realize that the moment you reorganize, this takes any team that has been changed, back to forming. In fact, if a company reorganizes enough, their teams rarely achieves the benefits of performing. What are some strategies in keeping teams in “performing”? At a high level, it is to minimize reorganizations. While some reorgs may be reasonable as part of an overall corporate strategy, others tend to be frivolous. Realize that a reorg will take a performing team back to forming that means a significantly negative impact to velocity and productivity, leading to reduced delivery. If you have to reorganize occasionally, attempt to minimize the impact to high performing teams. 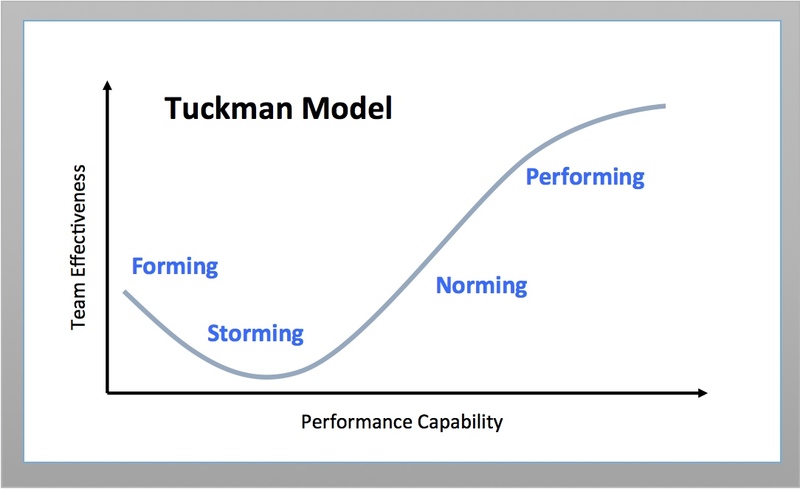 At a more detailed level, what strategies aligned with each of the stage of the Tuckman Model can help you get to performing effectively or more quickly. Let’s walk through the strategies at each stage. Forming is when the group of people are first introduced to each other. The cohort tends to be polite as they are trying to get to know each other. Some people will be excited while others will be anxious (and sometimes both). Forming may take time, as this is when people are getting to know each other and the work. People are trying to get to know each other and what they are there to do. - Introduce a series of icebreakers. Icebreakers provide a way for teams to get to know each other and start building psychological safety amongst each other. When applied periodically, it can help groups more quickly get to know each other. Consider the Constellation icebreaker as a start. - Initiate team chartering. In order to move from being a group of random individuals to a team of motivated people, it’s important to know what to strive for. Team chartering is an explicit practice that helps the team understand their consequential purpose, the direction in which the team is moving, and objective of the work ahead. Storming is when the group of people starts to play against each other and vie for position. Egos often are involved as each person is attempting to establish themselves with group. Some will want to be perceived as leaders, others may want to take a back seat. Conflict will arise between people’s natural working styles. This is also the time that niceness starts to wear off and where people start challenging each other. - Continue the path to psychological safety. Start establishing safety norms in meetings that encourage an equitable balance of speaking up and letting others speak. Normalize conflict by discussing how you want to act when conflict occurs. Hold icebreakers that focus on sharing vulnerabilities. - Conduct sessions that identify working styles such as Myers Briggs, Jung, DISC, Color, and more. Each member of the team should take the test and examine how they themselves operate. Then share their results with other team members and understand how to best operate amongst each other. - Groom the work together. This builds a common understanding of the work in a collaborative manner and keeps the team hyper-focused on the work ahead. Norming is where team practices become clear and everyone is attempting to follow them. Team roles are clear and accepted amongst the team. Team members have resolved their differences, begin to self organize around the work, respect how each other operates, and understand where to collaborate to get the work done. Team members begin to socialize, really get to know each other, and begin asking each other for feedback. - Begin formal feedback loops amongst team members. Get educated in how to give and receive feedback. Team members practice giving and receiving feedback. - Apply regular retrospectives so the team can identify areas of improvement. This is a whole team activity where everyone should be participating. Reflection of the work should lead to improvement actions that are added to the team backlog of work and collaboratively completed. - Establish team measures on how the team inspects, adapts, and improves. This may include team velocity, employee satisfaction, and delivery metrics. The team may experiment with increments of improvement to ensure they are moving in the right direction. Performing is when the team has a shared vision of their work, knows exactly what they are doing, and works independently with little assistance from their managers. The team continually achieves its goals and seeks to go beyond their goals. Team members attend to their relationships and look after each other. Differences are resolved in a positive manner. - Initiate Peer hiring where team members own and interview new team members. Team members determine fit and complementary skills such as problem-solving, technical, and interpersonal skills. - Team members agree to and apply intrinsic motivators to encourage high performance. This may include autonomy, mastery, and purpose, from Dan Pink’s list of motivational elements. When team members are paid fairly, these three elements and drive people to do their best work. 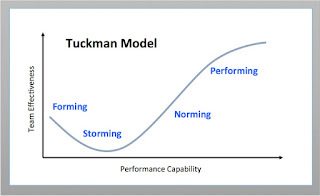 It is important to know that when a team moves through the Tuckman model, they may find themselves in several of the stages at the same time. For example, while a team may be “norming” on team practices, they may still be “storming” on how to work together. Understanding this model can help you appreciate where your team is today and what you can do to more effectively get to the next stage, ultimately learning to high performing. More importantly, it can help an organization be more careful on their frequency of reorganizations as this can bring many of their teams from performing back to forming. Last week, I had the fortune to enjoy the benefits of a concierge lounge at a prestigious hotel. As I was enjoying hors d’oeuvres, I initiated a game I like to play called “observe the people”. As simple as it sounds, it allows me to discern how people interact with each other and identify any interesting traits. I noticed and talked to people who were travelling for business, those that may be considered leaders in their respective industries. Most of those in the lounge could be considered a bit privileged in their expectations of both service and amenities of the lounge, not at all unreasonable in the context. I noticed the host who was checking-in the guests into the lounge at his desk. He was busy registering people and providing information about the lounge. He was doing this continually for an hour as I was working on my computer getting some odds and ends done. As guests were getting drinks and food, I saw that the host had nothing to refresh his palette yet he was the busiest person in the lounge. With that awareness, I walked over to the host and offered to get him a drink and some food. He looked at me with surprise and said, “You are the first guest in 5 years who has offered me a drink.” That caught me by surprise. How could that be? Have we gotten so invested in our privilege that we forget that part of our responsibility as leaders is to serve those that help us? 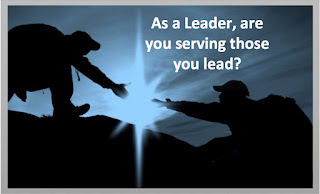 If you are reading this and thinking, “Why should I serve those that I lead when they should be serving me?” you may have a learning opportunity to help yourself and your team, group, division or company. A major part of your job as a leader is to help maintain and improve the health of your employees. This takes a page from the concept of Servant Leadership. While there are various key servant leadership attributes, the ones I find important are an ability to listen; capability to empathize with people; aptitude to heal others (both mentally, physically, emotionally, socially, and spiritually; an awareness of your surroundings, ability to persuade and conceptualize, have foresight, be a steward to stakeholders, customers, partners, and employees; a commitment to grow people encouraging innovation, self-initiative, and learning; and a need to build community. As a leader, your first response should be to greet your employees (aka, those you serve) and then ask if there is anything we can do for them and ask if you can remove any impediments in their way. Understand that by being that servant leader, you make your employees feel known and important. You should also remove their impediments helping them deliver products and services quicker, which has the benefit of making you money earlier than later. Remember, employees or those that are helping you. They are the engine to your success. Serve them. Remove their impediments, listen to their needs, and get them a drink. Is it time to get serious and sincere in helping them? 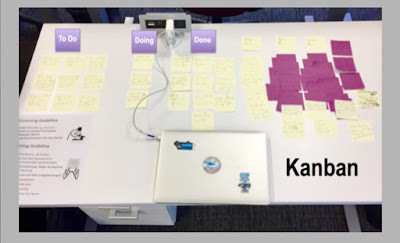 Can your Desk become your Kanban Board? Yes, it Kanban! Once upon a time, I found I had little space in the office to organize my work. With the more recent office hoteling policies, while there is more flexible space, there is less of one’s own personal space. I wanted a place where every morning I can quickly see my work ahead of me. While there are online tools that I can use, I wanted something more tactile. What I did have was a desktop surface. I did have post-its, and sharpies. I decided to experiment with Kanban on a physical desktop. As an Agile Coach, I work in iterations and increments much like I educate and coach my teams and organizations. It allows me to listen to what my customers want and prioritize the work based on value, much like a Product Owner should do. With this in mind, I used my tools to craft a kanban board on my desk. Before I go any further, allow me to provide you with a brief description of what is a kanban board. It is a work board that helps you visualize both the work and the flow of that work. It helps you optimize the flow of your work by understanding your WIP (work in progress) limit. In its physical form, it is usually shaped by a few state transitions as columns, the most basic include ‘To Do”, “Doing”, and “Done”. My work card (where I write the activity) was written in canonical form that included when the task was written and then when I completed the work on the card, the “done” date. I took the initial discovery activities that my client (aka., customer) and I agreed to, wrote them onto post-its with my sharpie, and added them to the kanban board in priority order based on both value and order dependency. As I completed some of the discovery tasks, I added new tasks from my customers to the “To Do” column and reprioritized on a regular basis. I experimented with keeping my WIP limit to about 3 activities in “Doing” at a time. What I liked about this kanban experiment was that each morning when I got to my desk, I had my work right in front of me. This immediately reminded me of my work for the day. It was very easy to maintain as it only took some post-its and markers to update the board. Every morning I checked the work that was in “Doing” so I knew what I had to get done for the day. I also enacted a quick reprioritization of the work so I knew what to pull from the “To Do” column when I had WIP. I managed to get a lot of work done this way. I’d say the experiment was a success. What did I learn? That it is too easy to add more activities into “Doing” adding to WIP. This had the unfortunate result of slowing my throughput. What else did I learn? That yes I kanban! Are you a Leader that Serves?